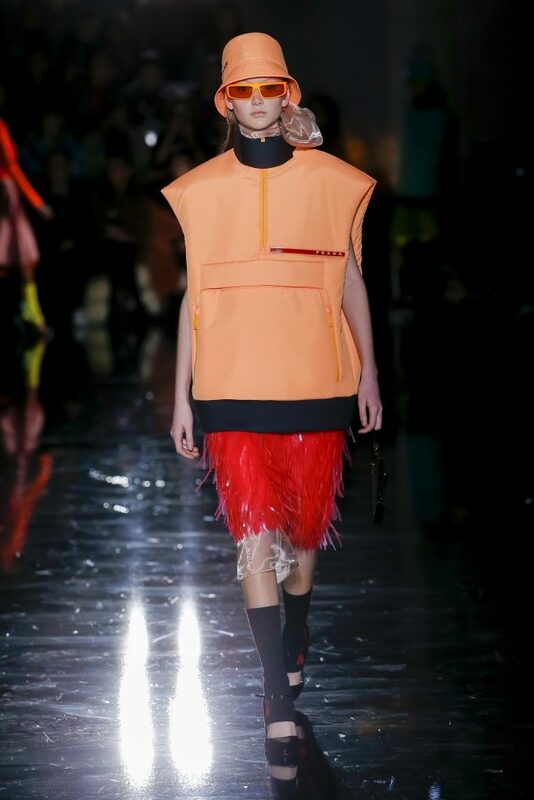 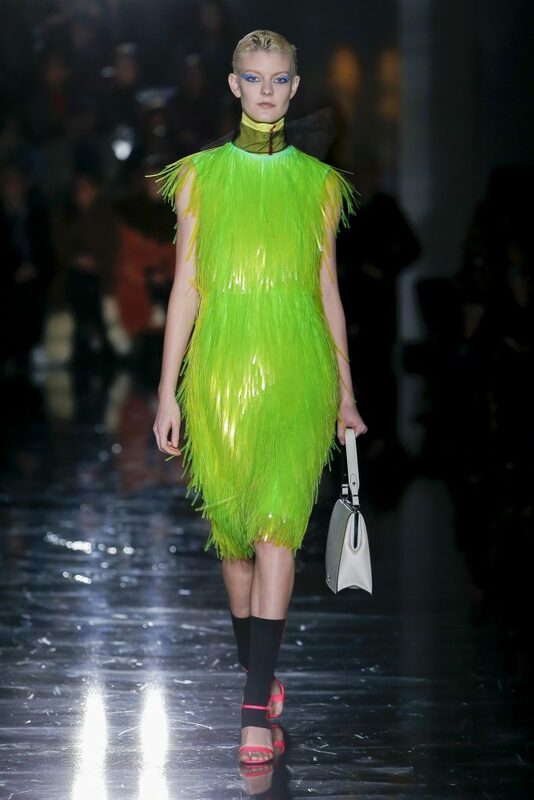 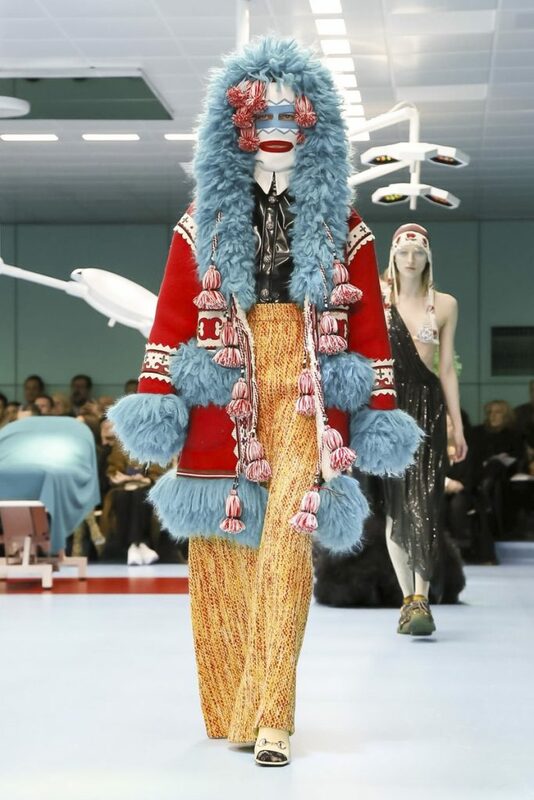 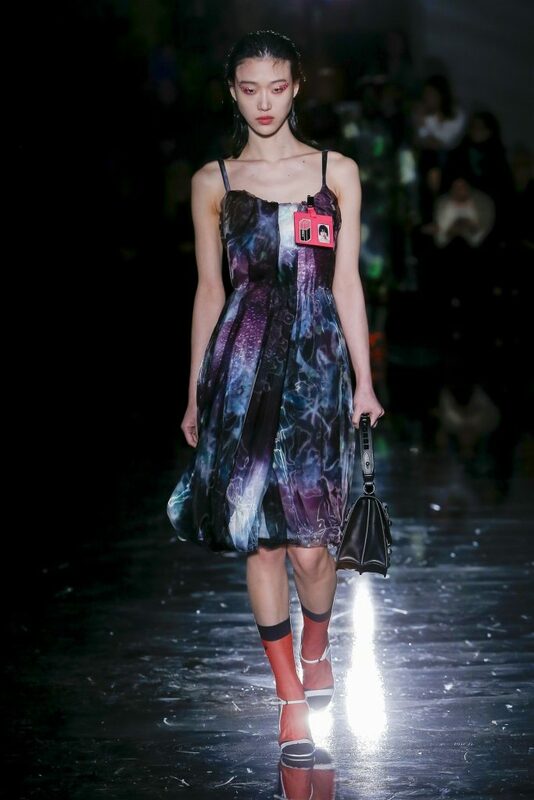 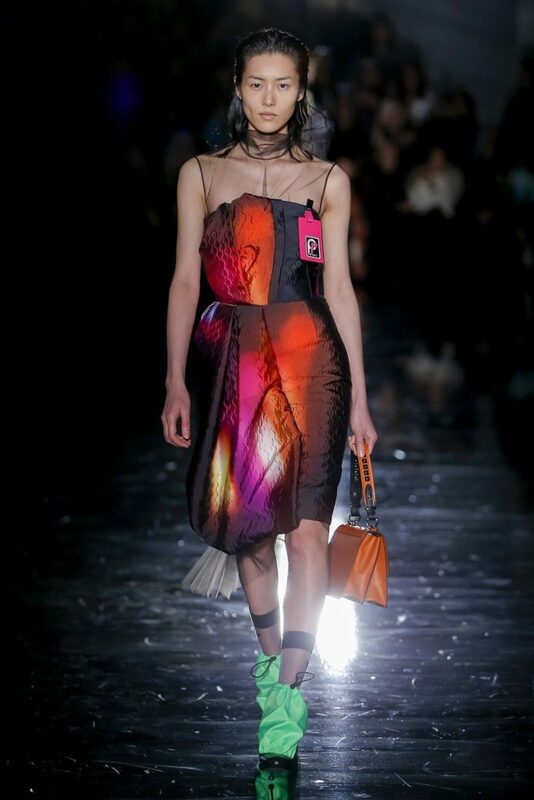 Drones Modelling Handbags and Baby Dragons Used as Props – Everything You need to Know About Milan Fashion Week Fall ’18! 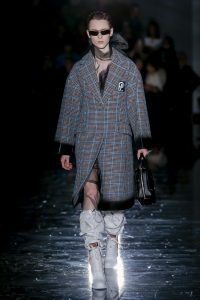 The Milan Fashion Week Fall ’18 was a chic spectacle featuring headscarves, kilts and fringes. 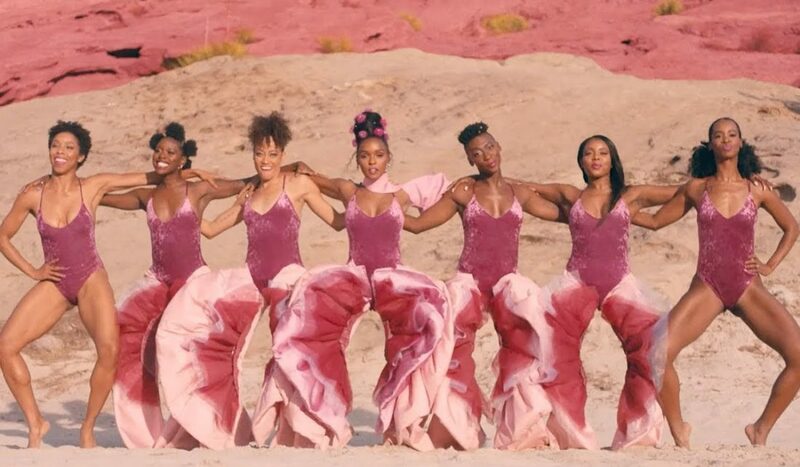 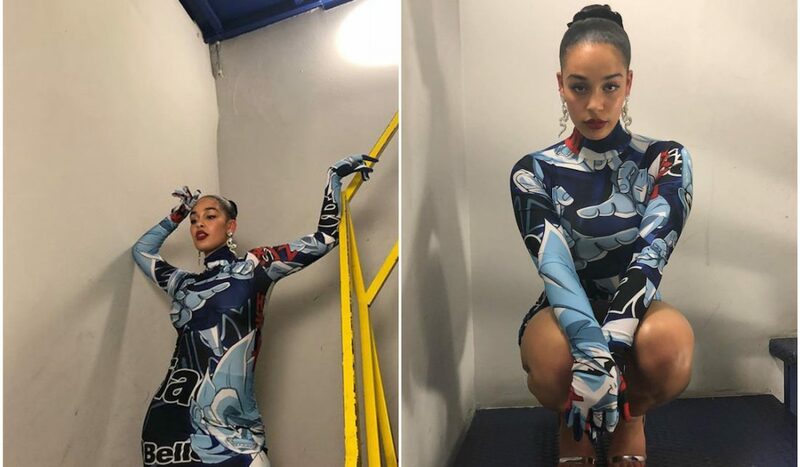 Designers are continually adding personal and political narratives to their collections, placing fashion in the intersection between politics, sociology, and commerce. 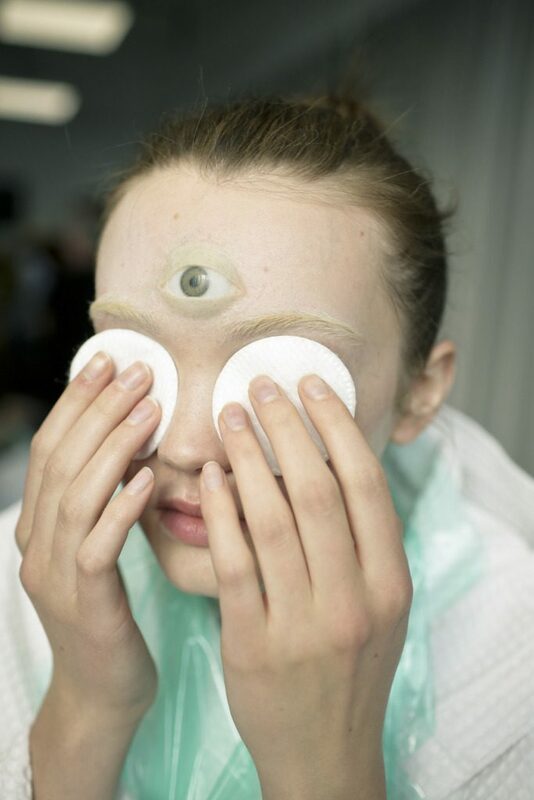 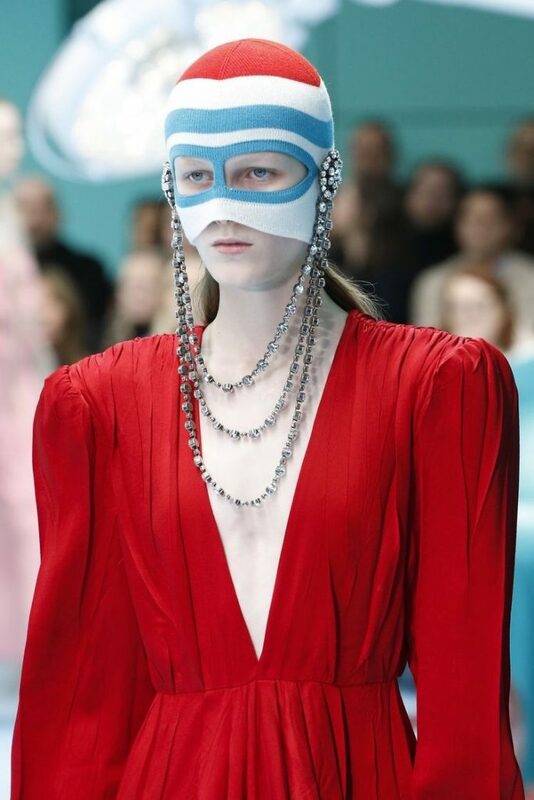 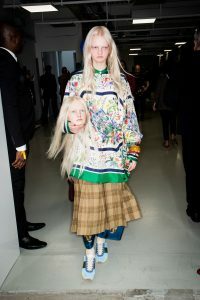 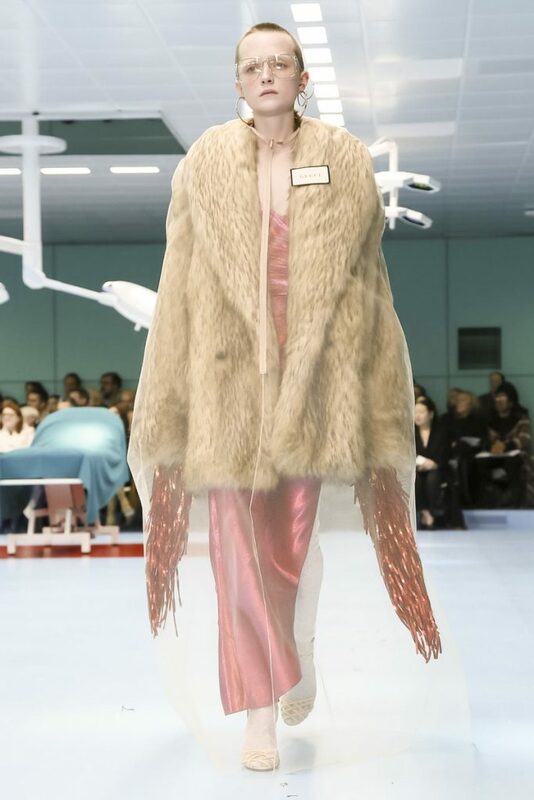 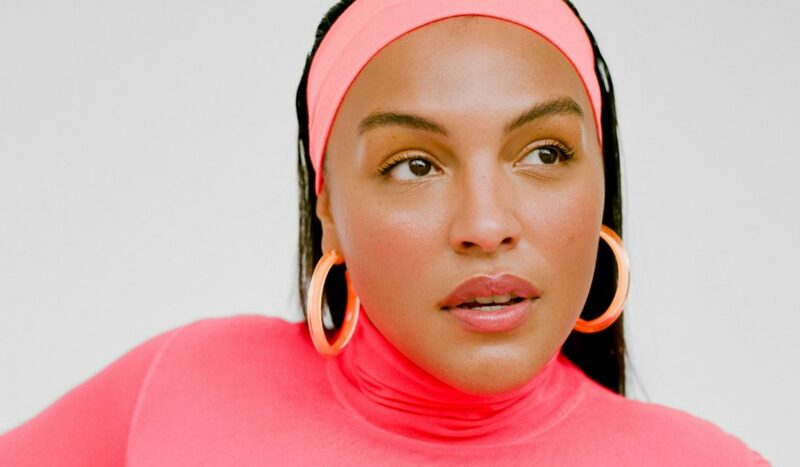 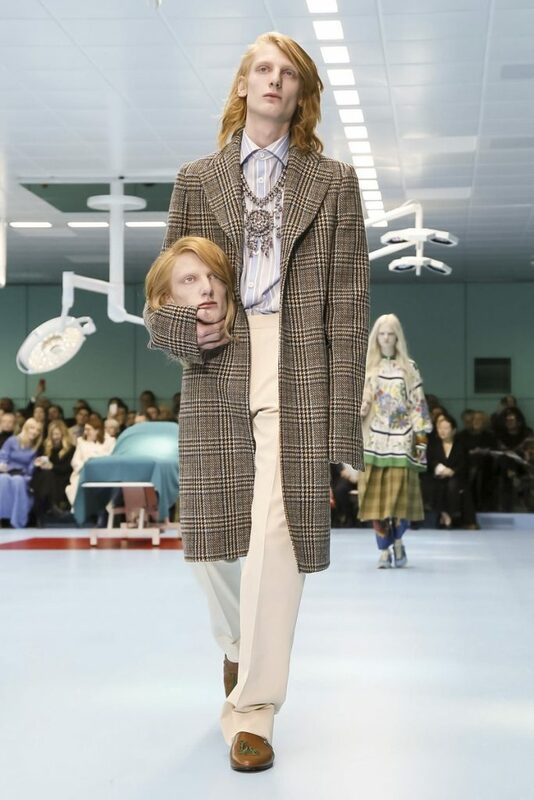 It’s an interesting space for fashion to thrive within – and we could never have guessed that it would result in models carrying replicas of their own heads, or name tags becoming an actual trend. 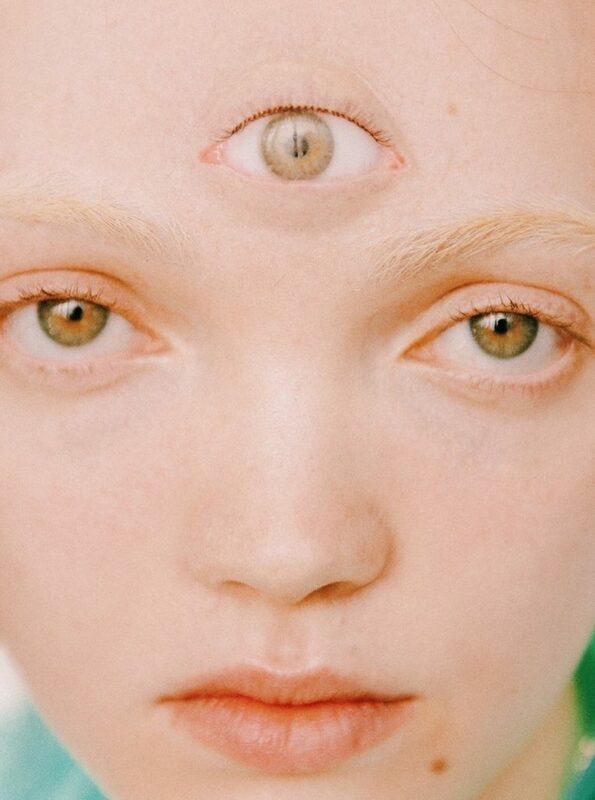 If you’re having trouble keeping up, don’t worry! 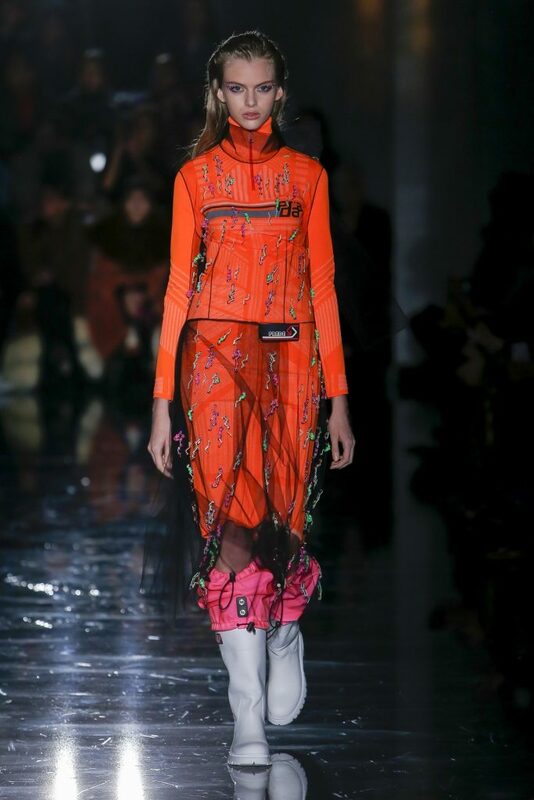 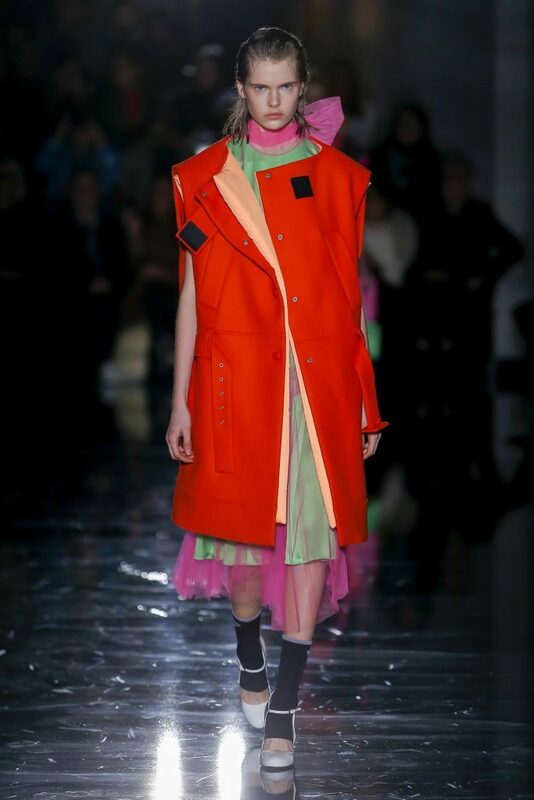 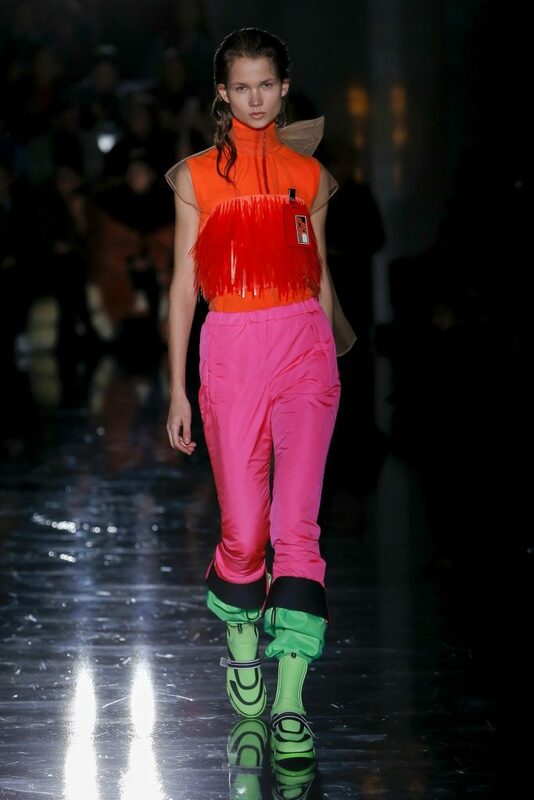 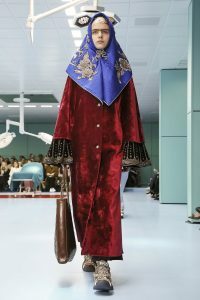 We have summarised our favourite collections from Milan FW ’18 below! 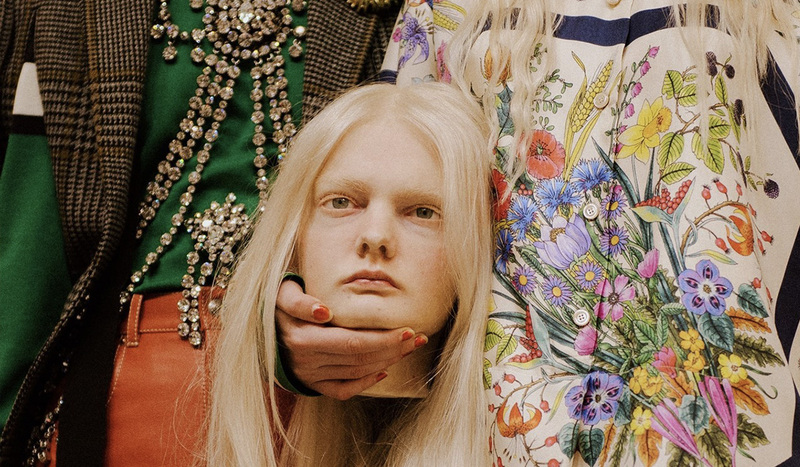 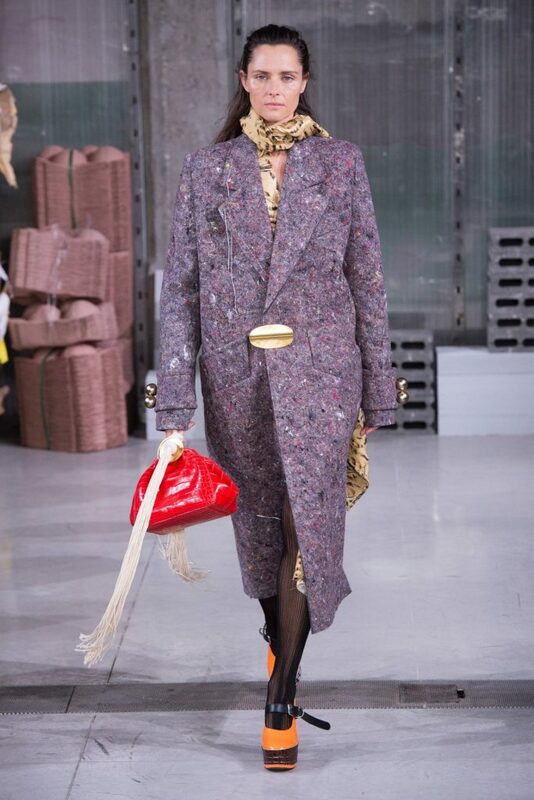 Let’s just say Alessandro Michele pulled out all the stops for this year’s fall collection! 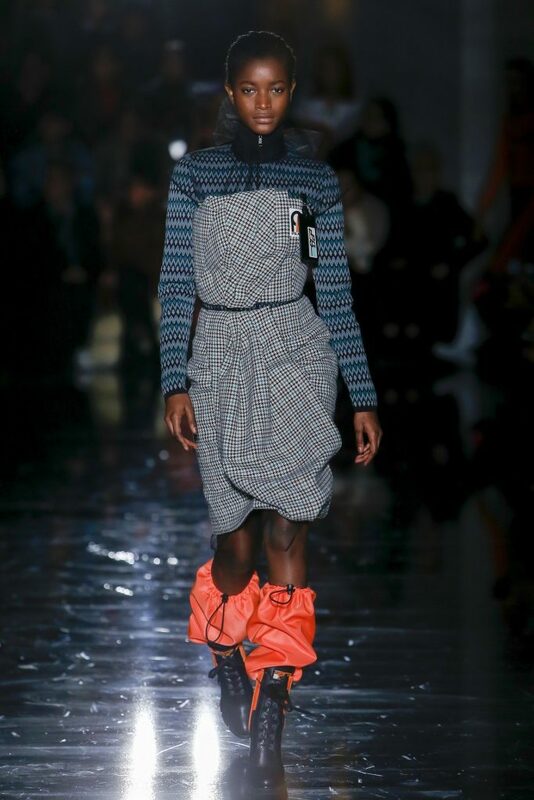 It was a thrilling event representing the struggle of finding one’s identity in today’s hectic information age. We are the Dr. Frankensteins of our own lives, piecing together ourselves through the means of technology, social media, pop culture and, of course, Gucci. 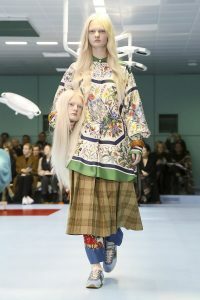 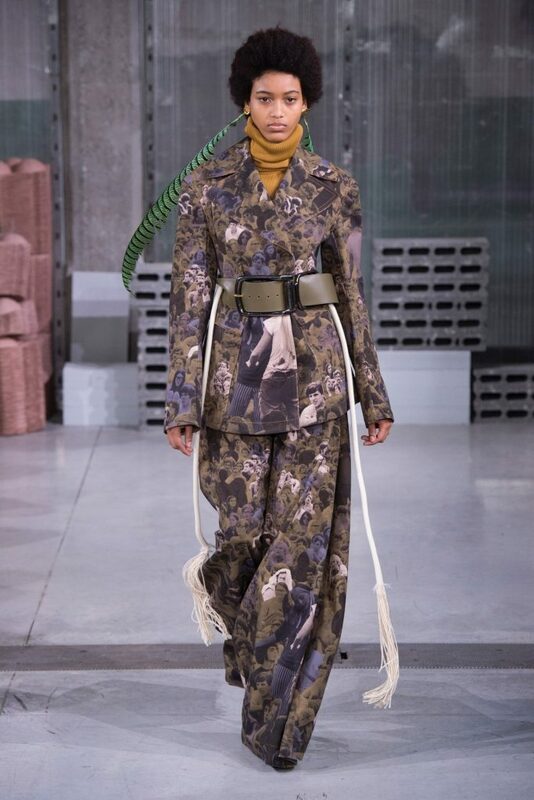 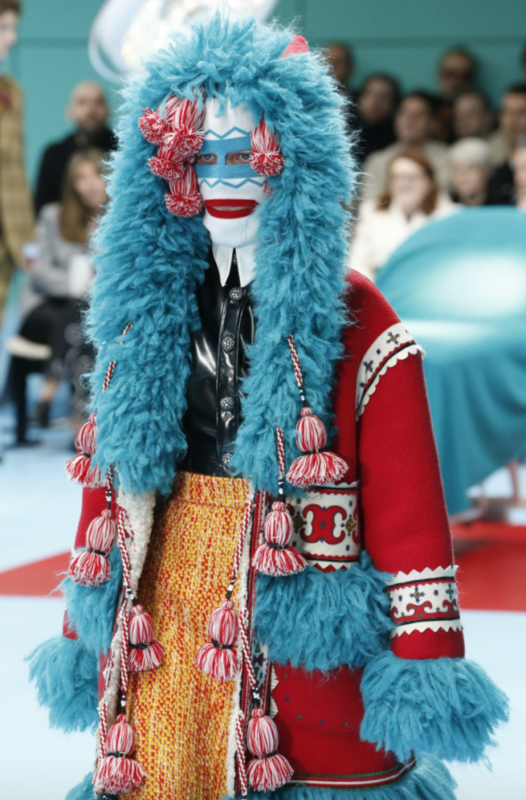 The collection was a multicultural extravaganza featuring Sikh turbans, Russian babushka headscarves, Scottish plaid, and a headpiece in the shape of an Asian shrine. 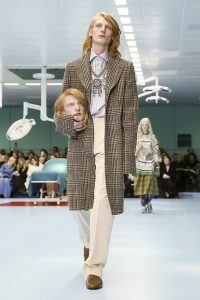 Last but not least, models were cradling what looked like baby dragons and eerie replicas of their own heads. 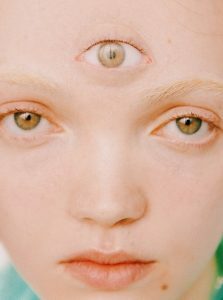 It was a sight to behold. 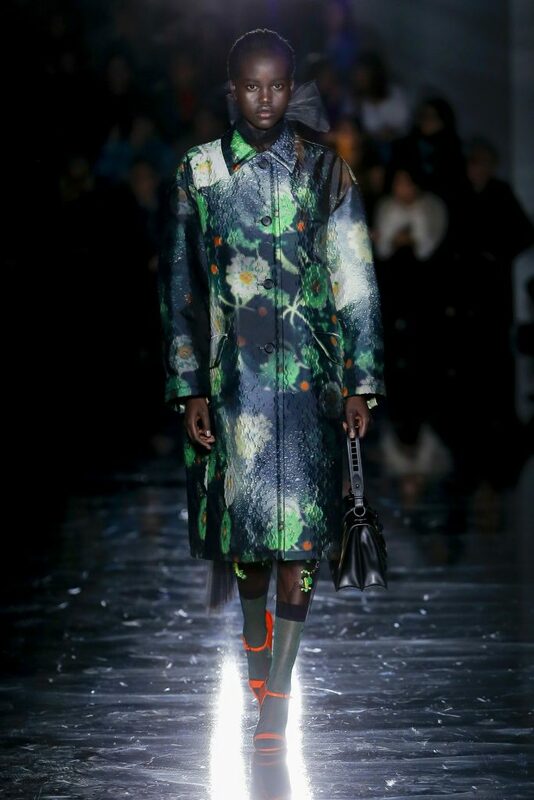 Paul Surridge has quite the difficult shoes to fill after Cavalli. 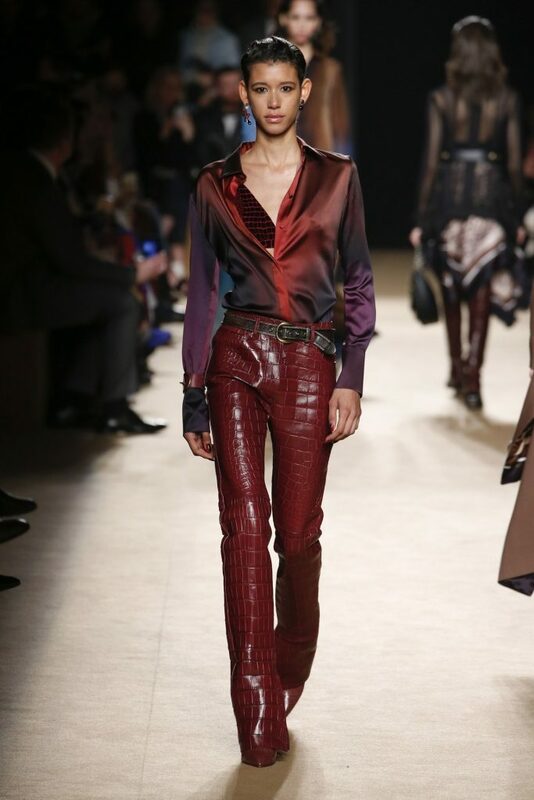 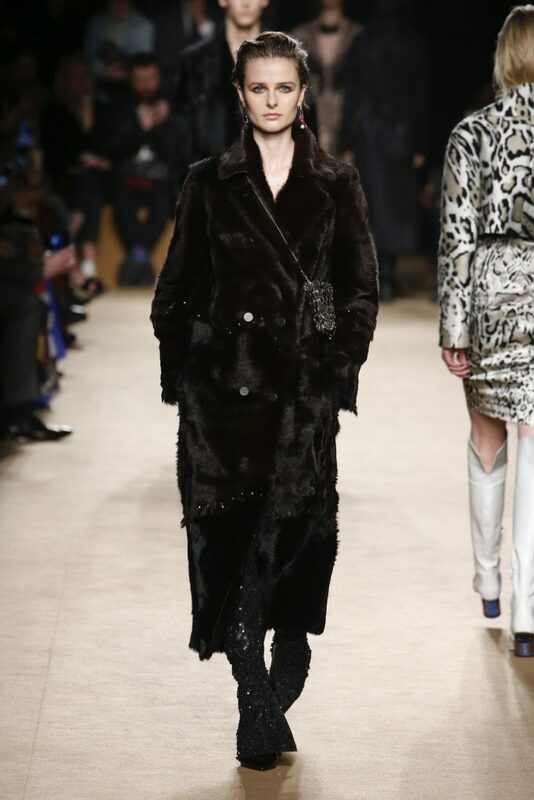 Especially at a time when the Cavalli signature animal skins and glamour style is becoming increasingly outdated. 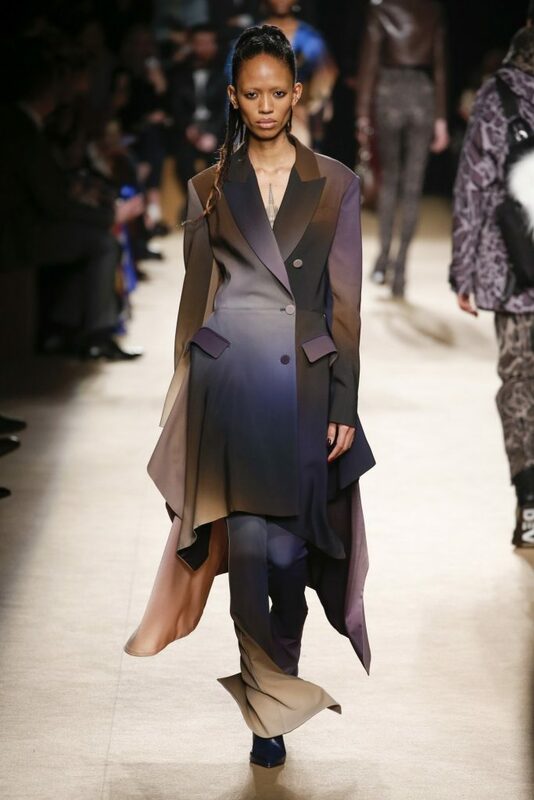 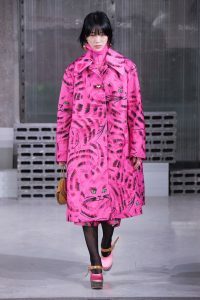 Surridge did, however, grapple with this challenge adequately, showing us a collection of dresses in ombre hues, plenty of animal prints, a tuxedo jacket with slit seams, and sultry see-through dresses worn over black lingerie. 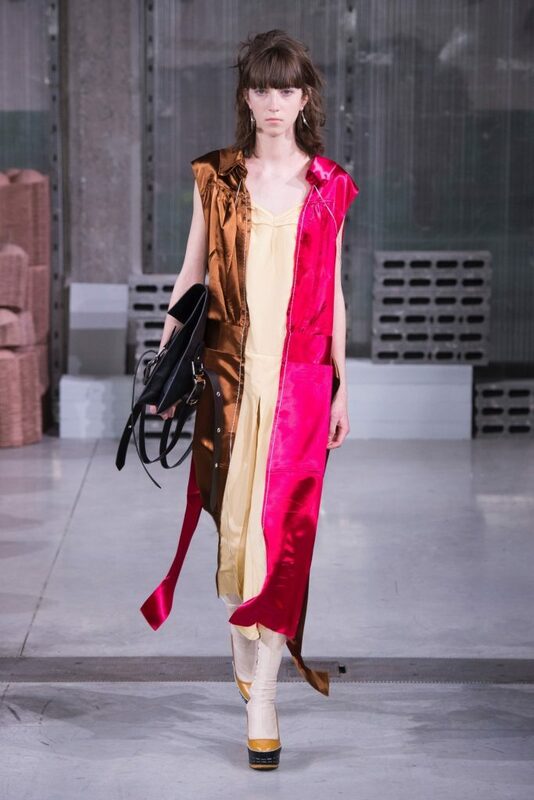 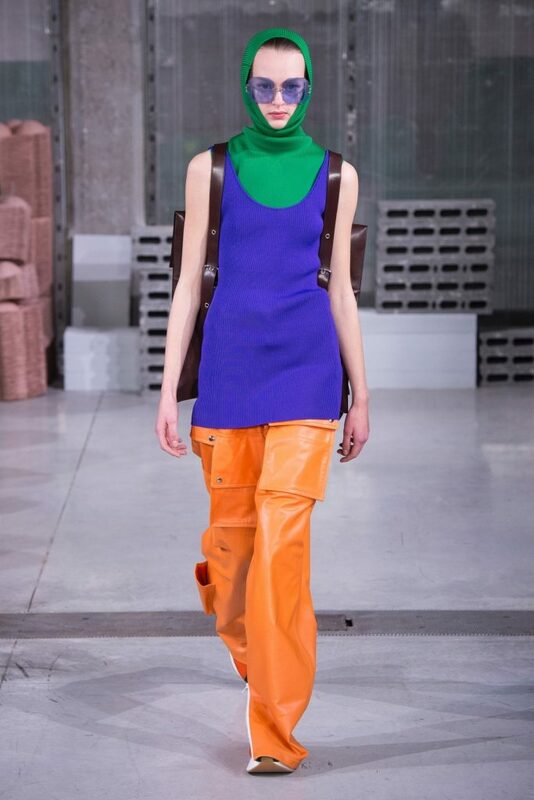 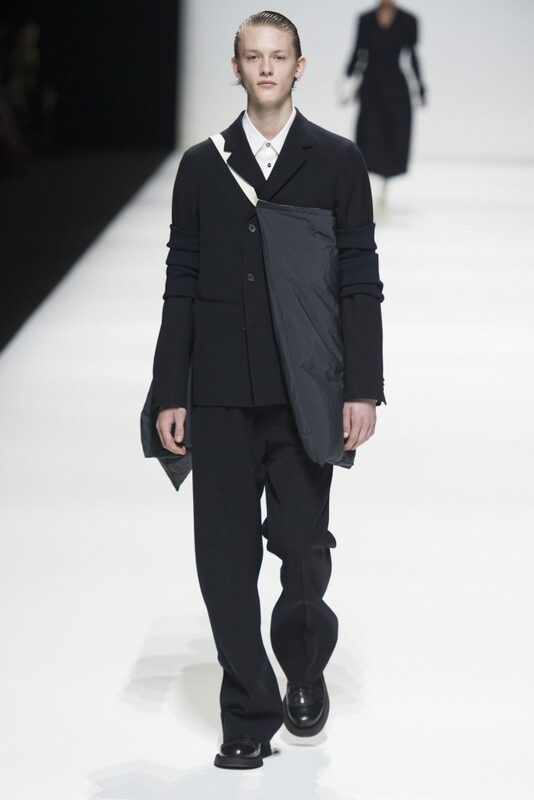 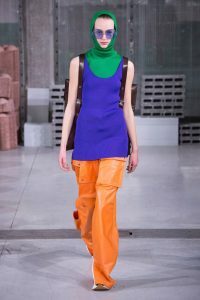 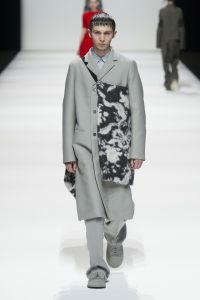 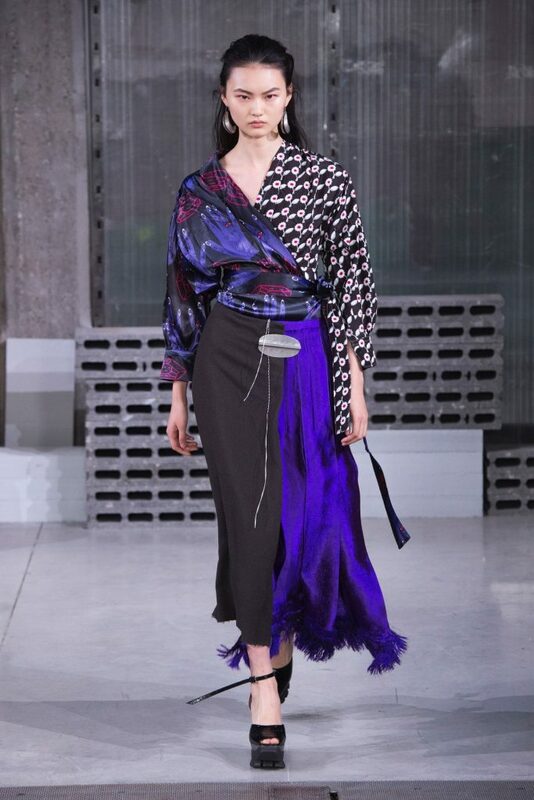 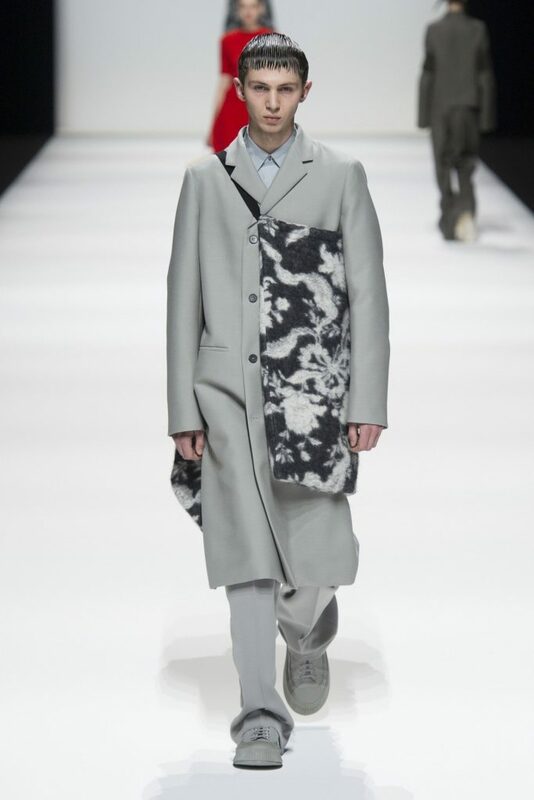 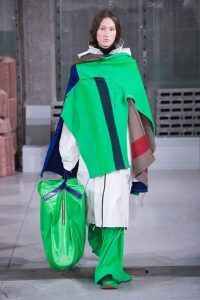 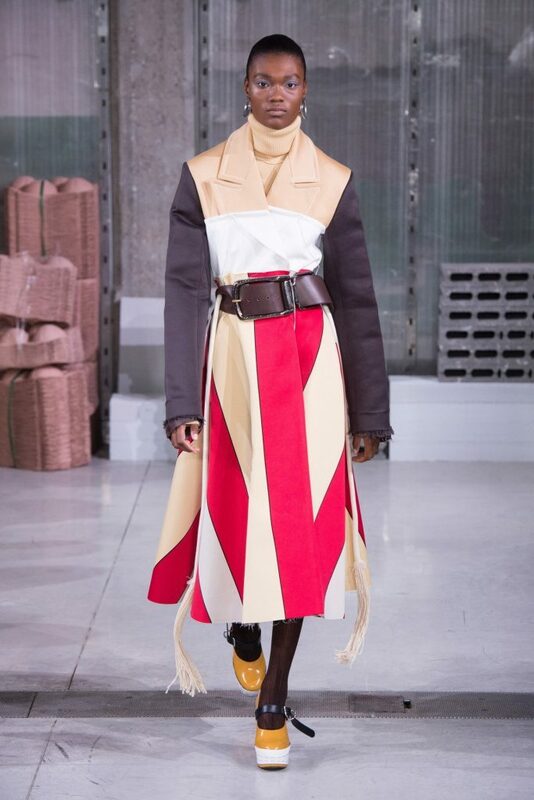 The viewers of the Marni fashion show this year were seated on piles of fabric, sleeping bags and carpets. 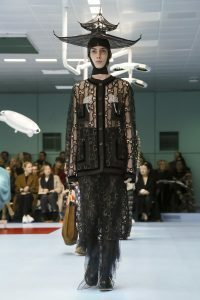 A jumble of old clocks were placed in the corner. 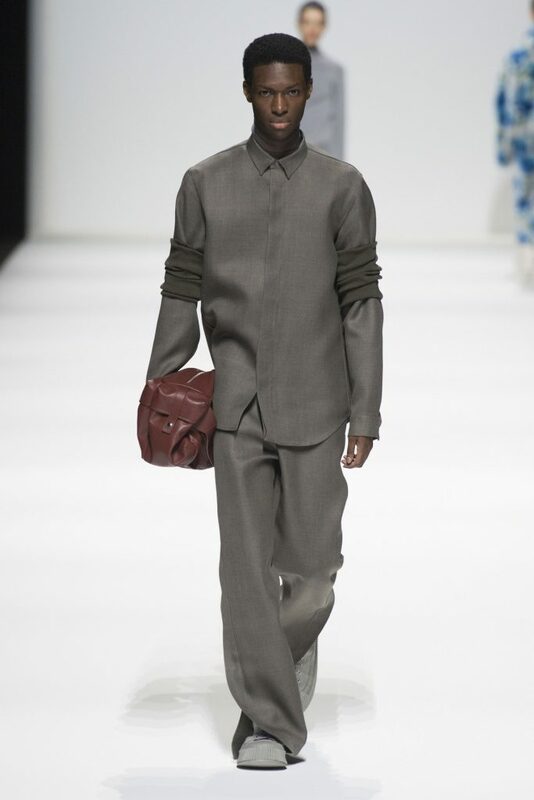 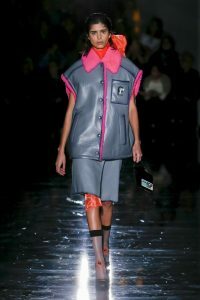 The goal was to express themes of human waste and to bring up issues of sustainability within fashion. 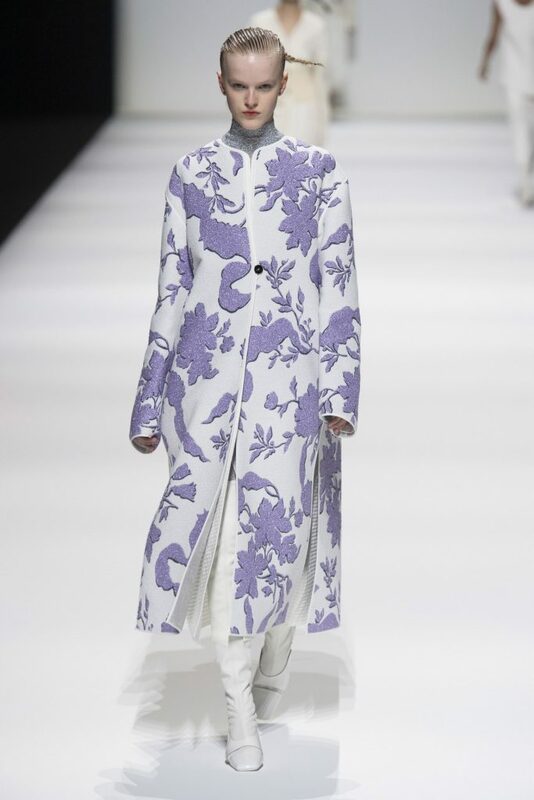 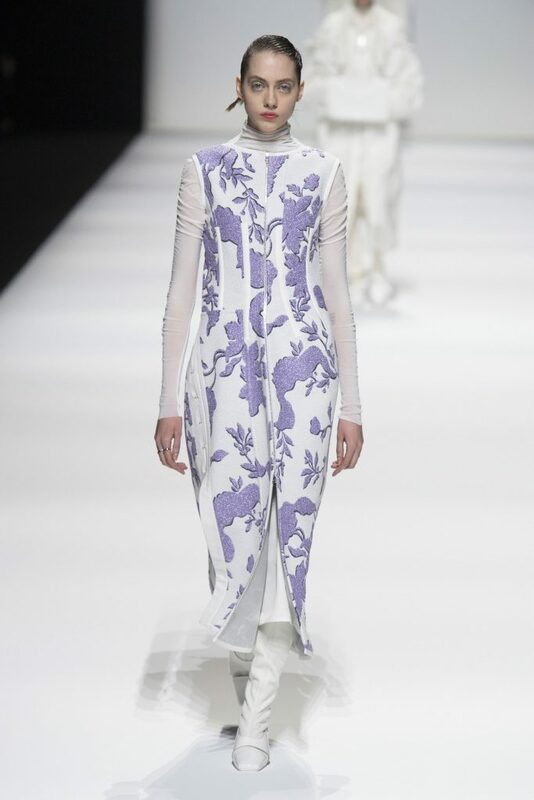 Francesco Risso pushed his fashion towards a more sustainable route by presenting a violet, felt coat made from recycled textiles. 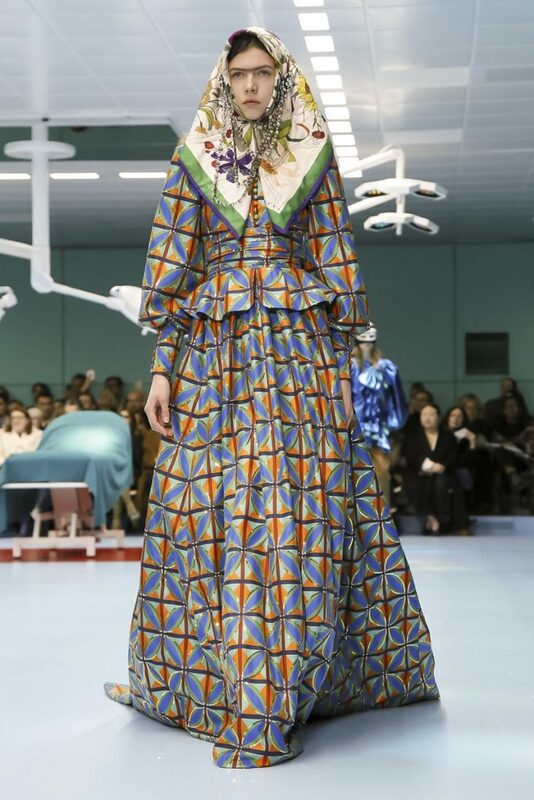 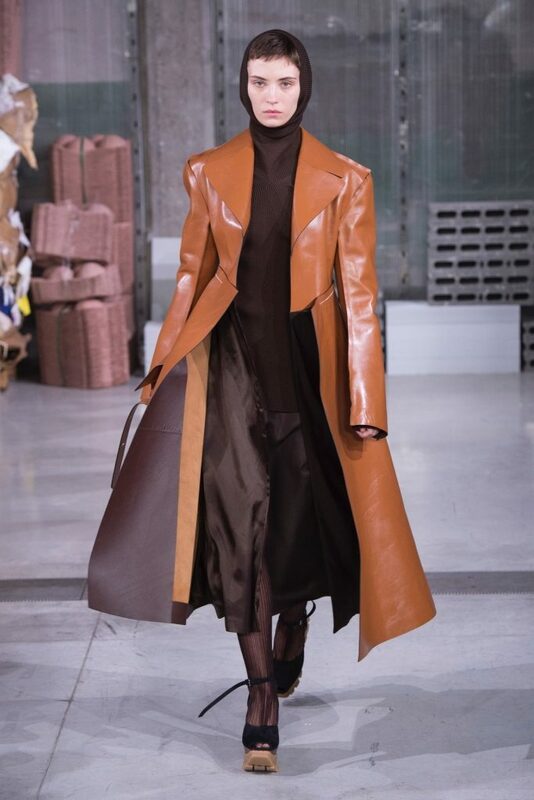 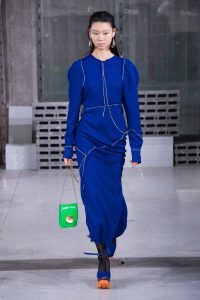 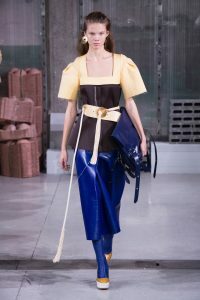 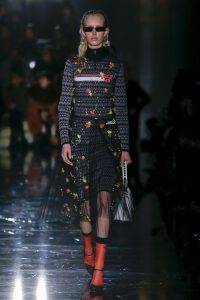 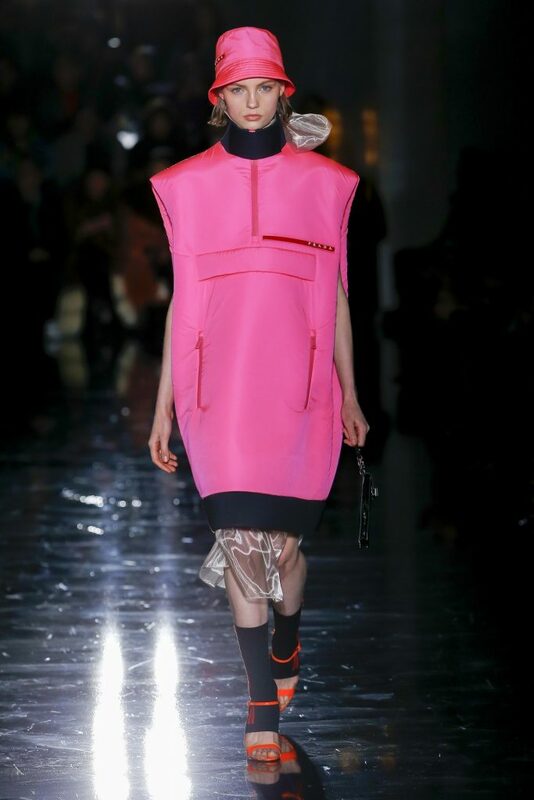 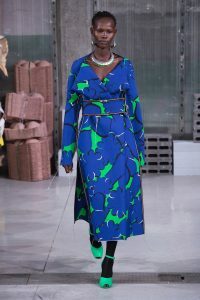 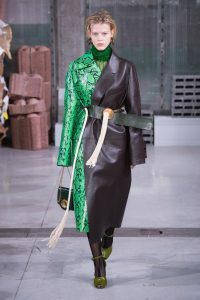 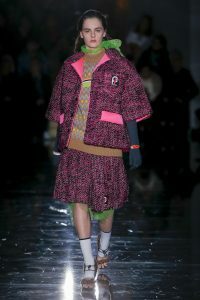 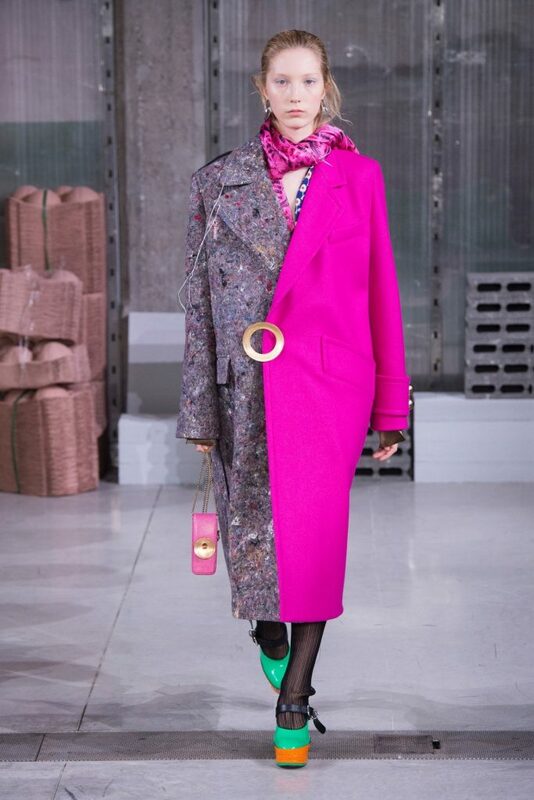 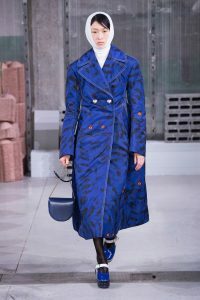 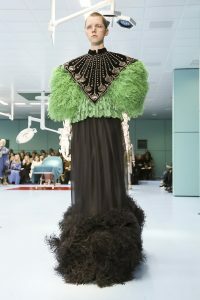 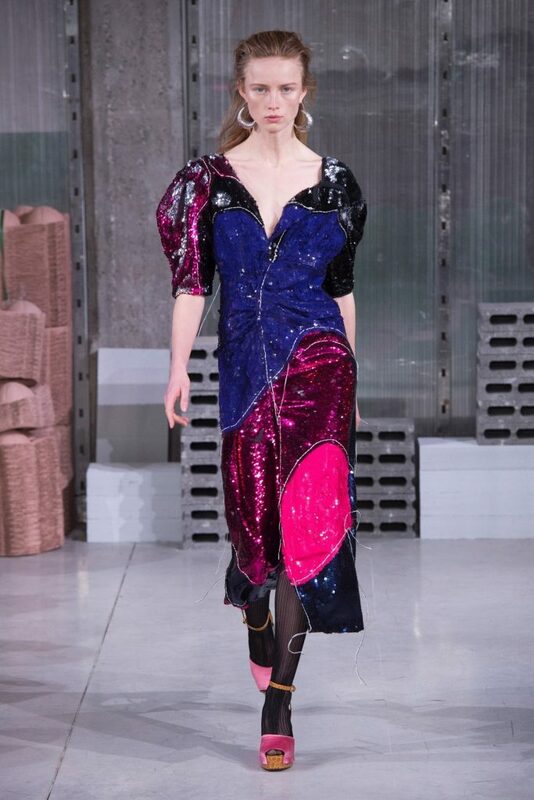 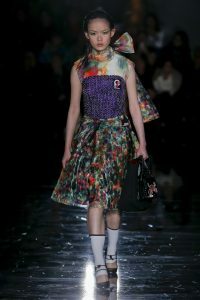 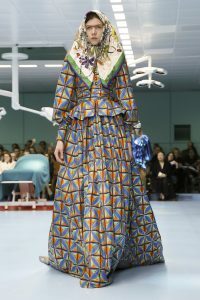 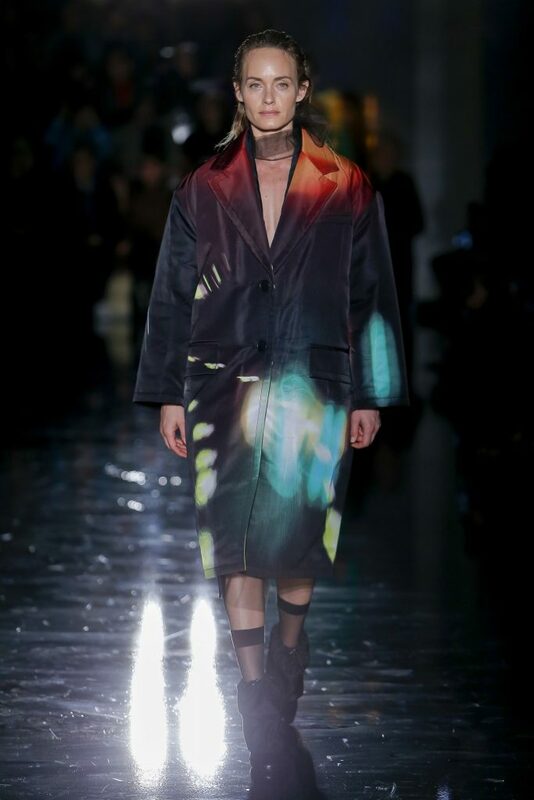 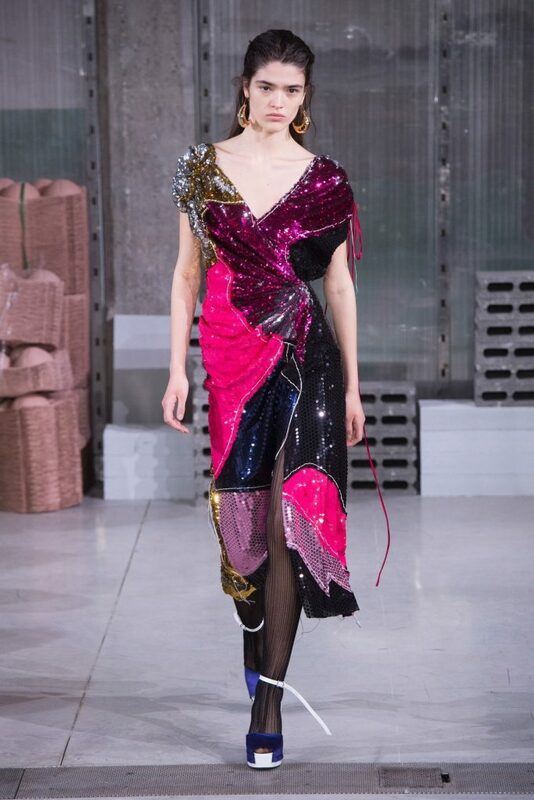 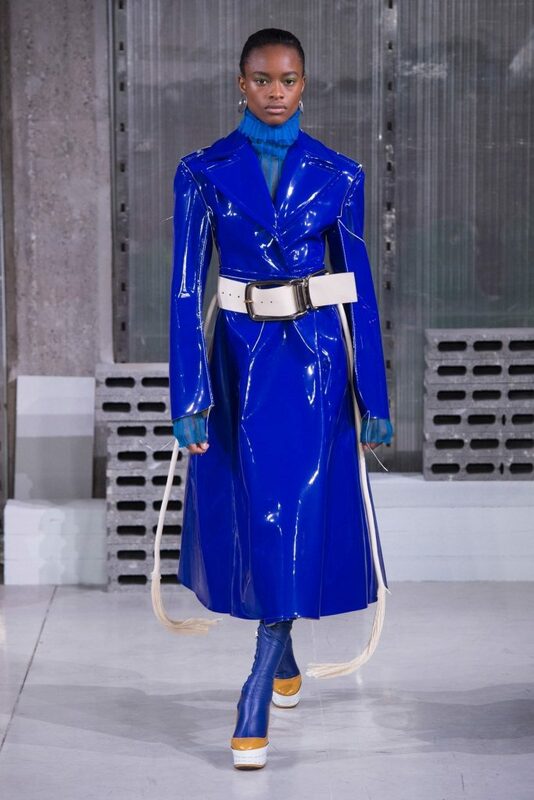 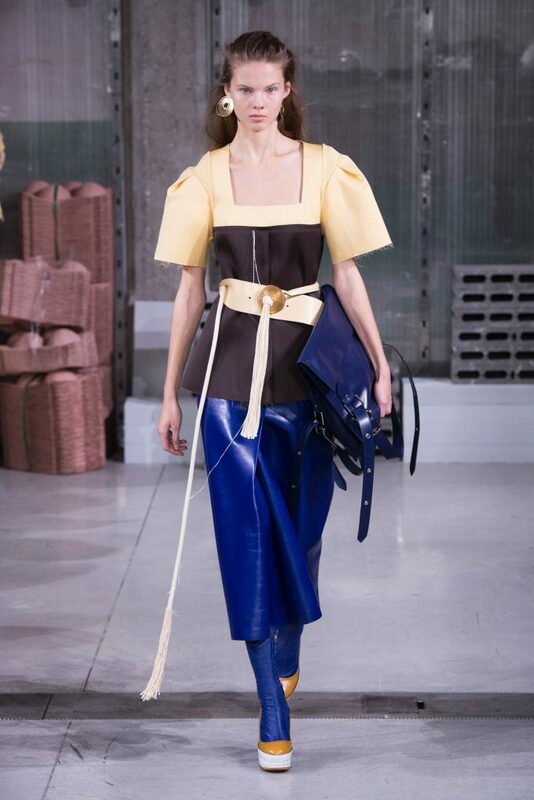 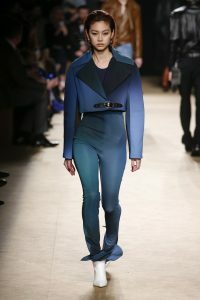 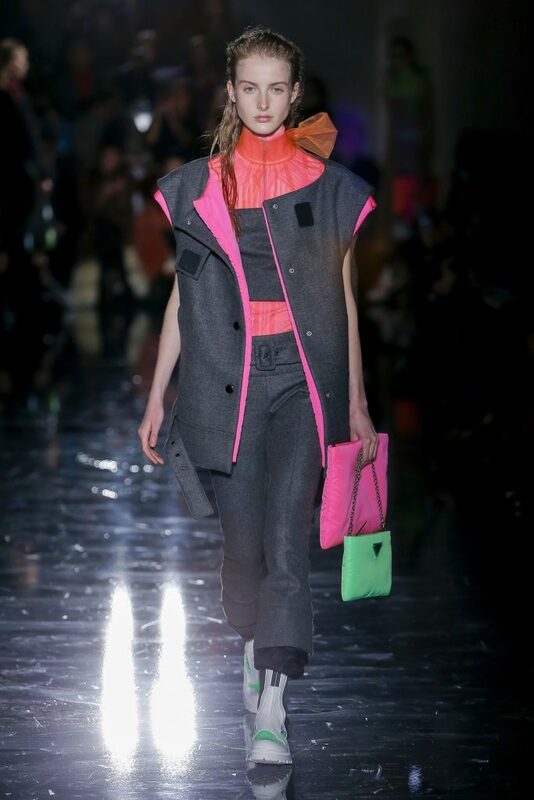 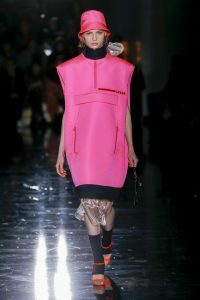 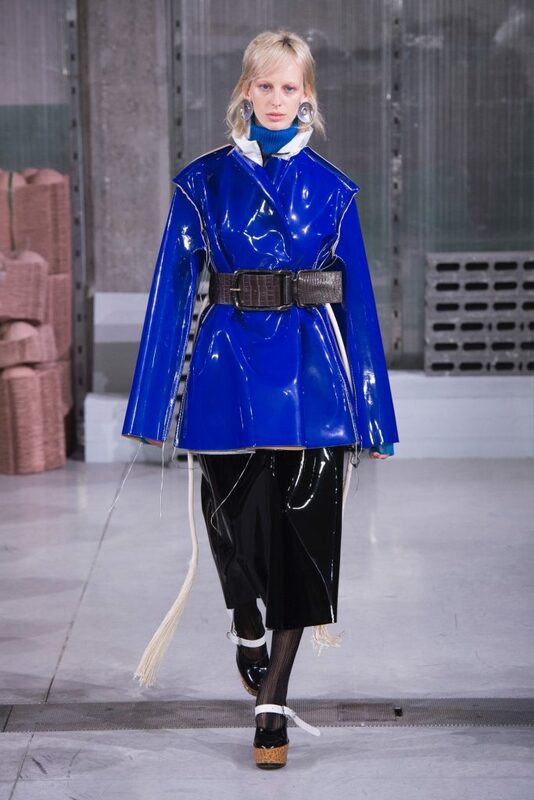 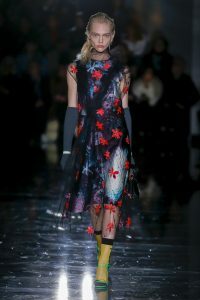 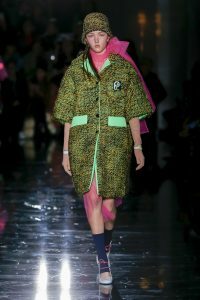 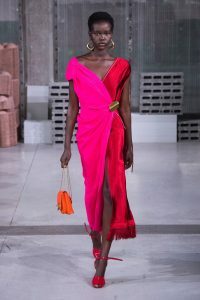 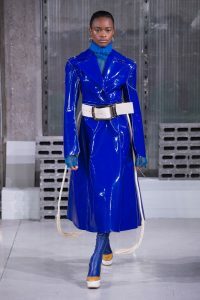 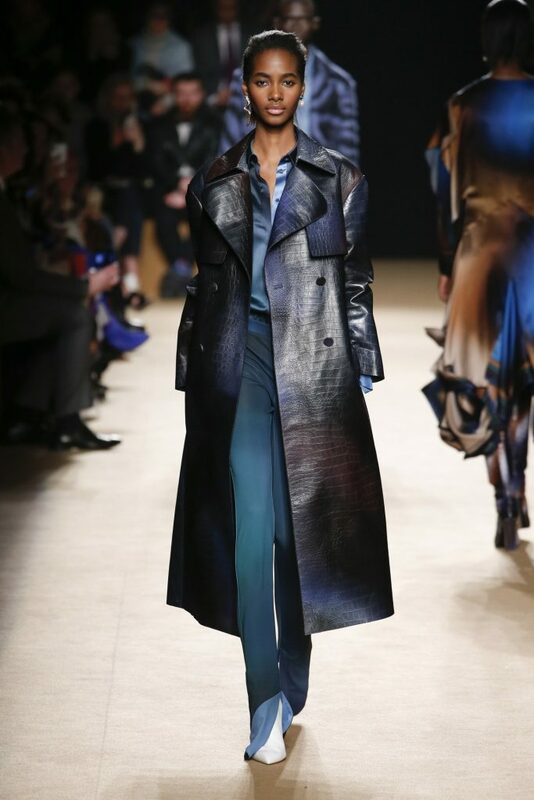 The collection also featured high-shine, bright blue coats, shoe and belt straps hanging loose, and dresses pieced together from two different fabrics. 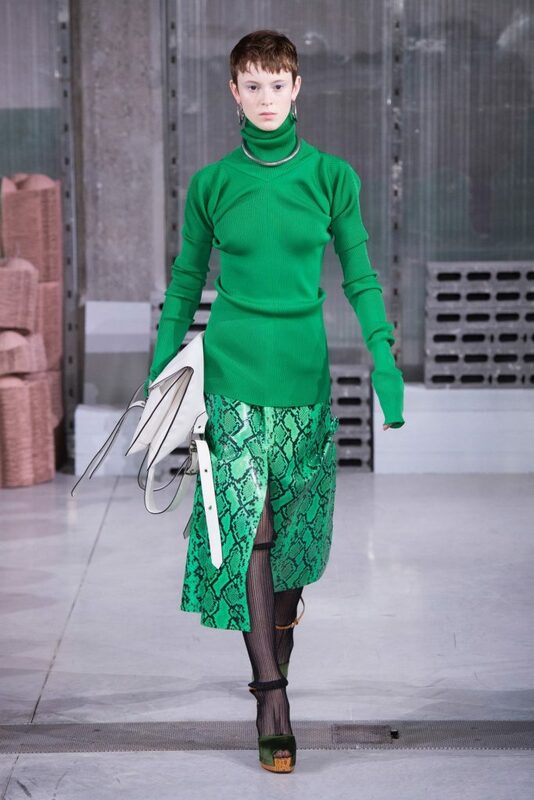 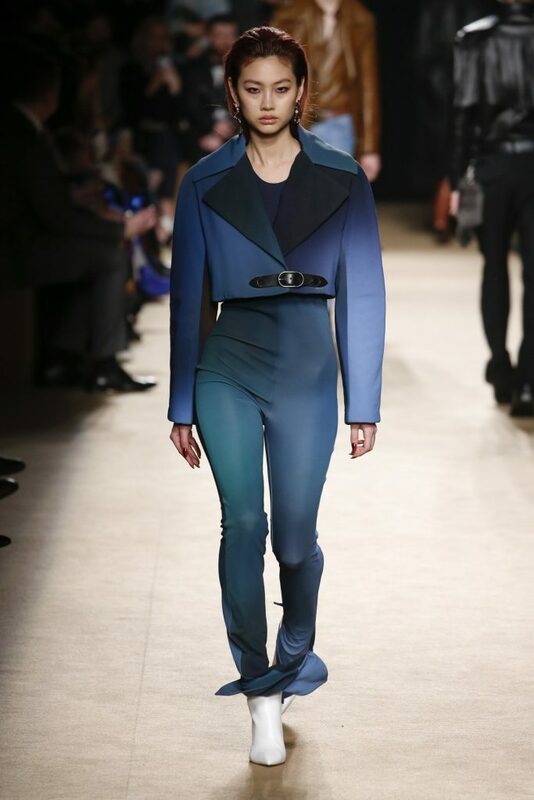 Fall ’18 was the second runway season for Lucie and Luke Meier, and the collection was futuristic yet soft. 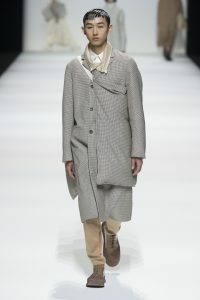 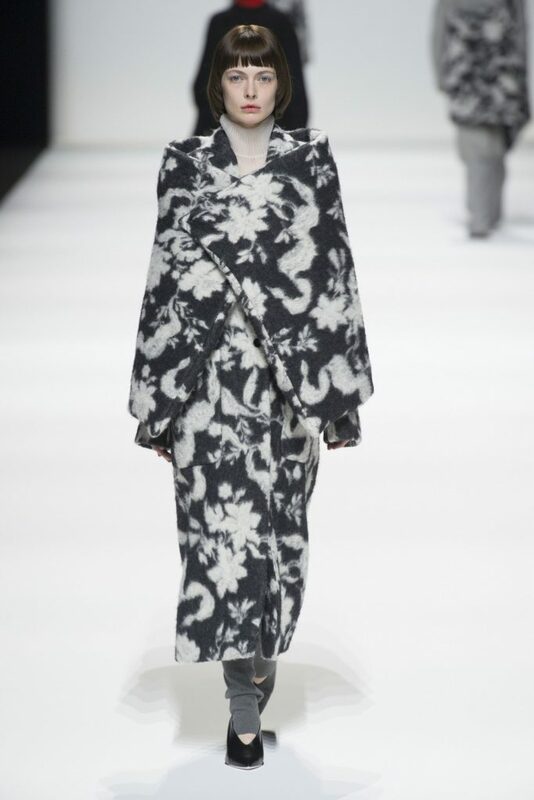 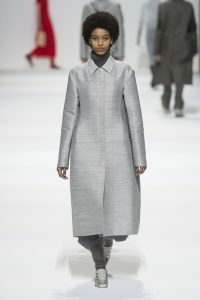 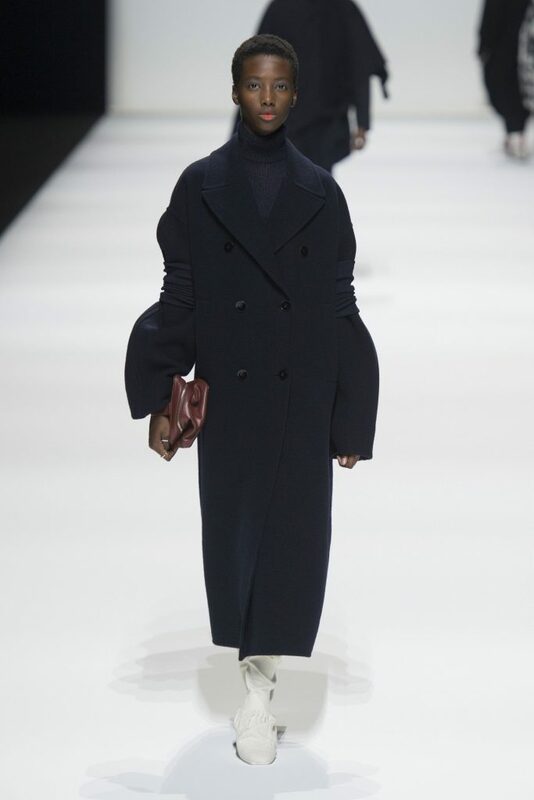 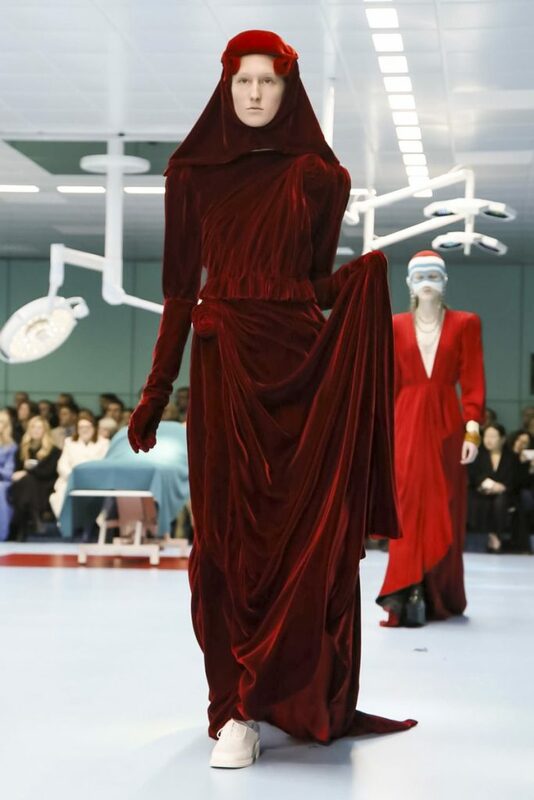 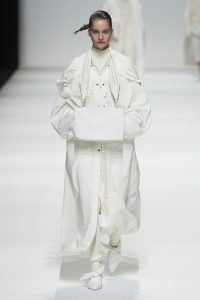 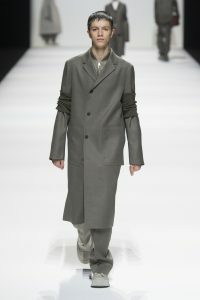 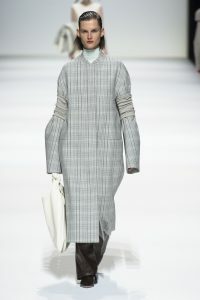 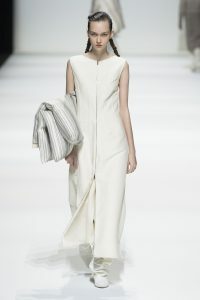 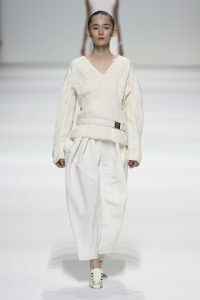 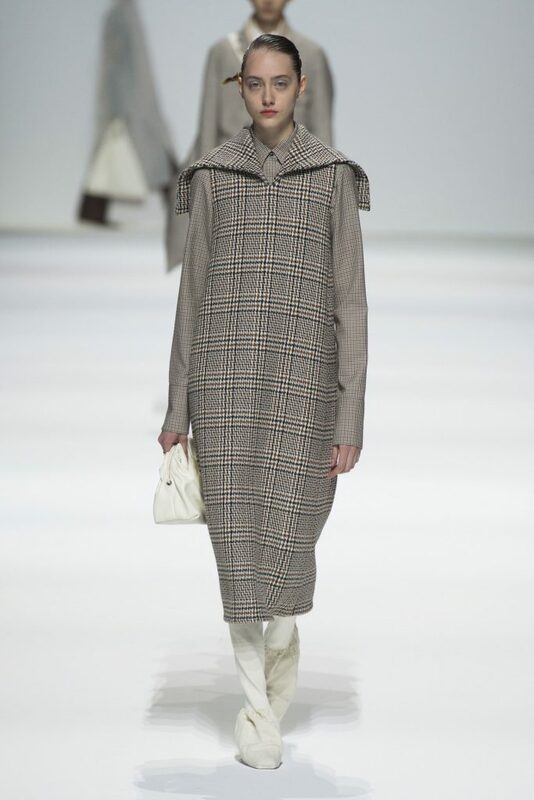 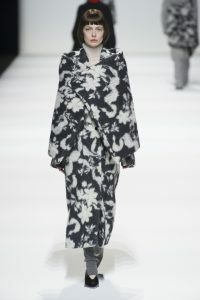 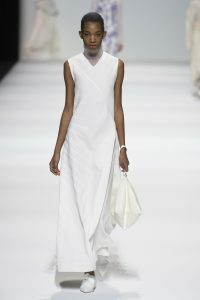 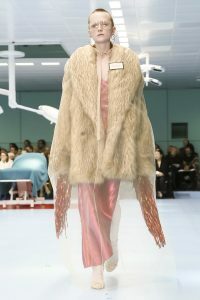 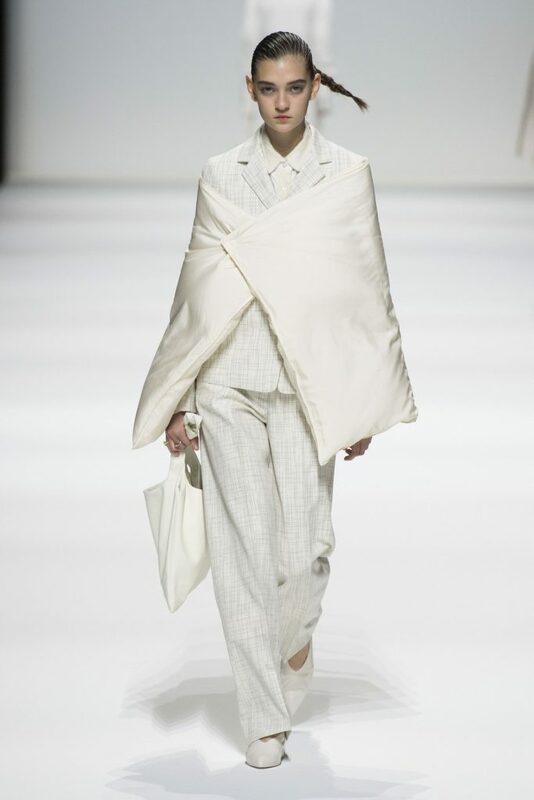 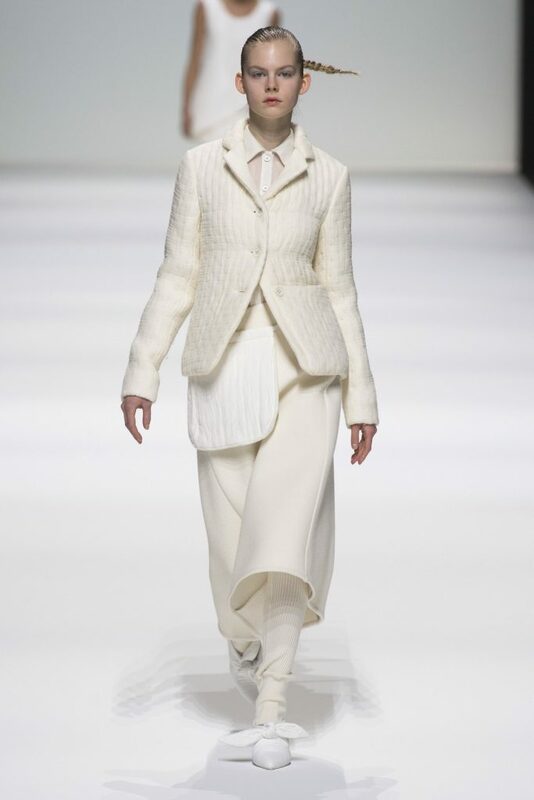 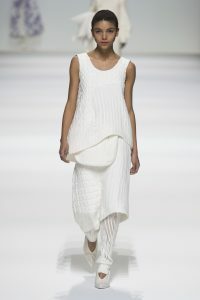 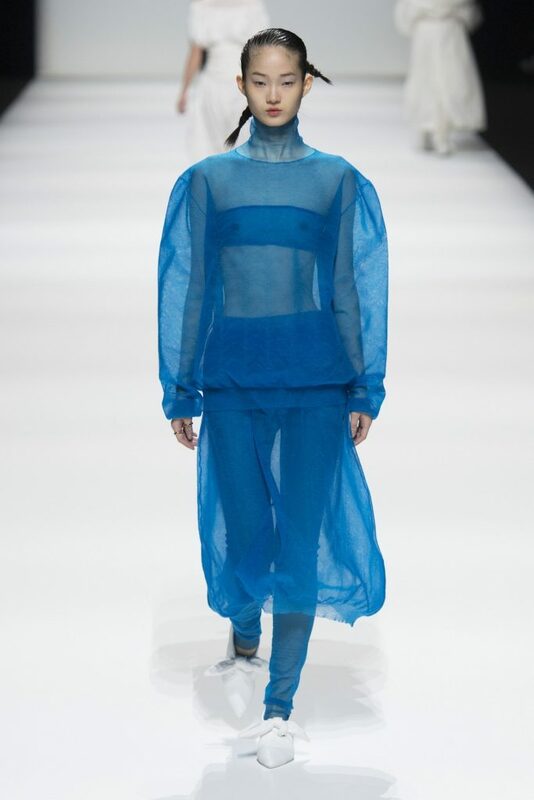 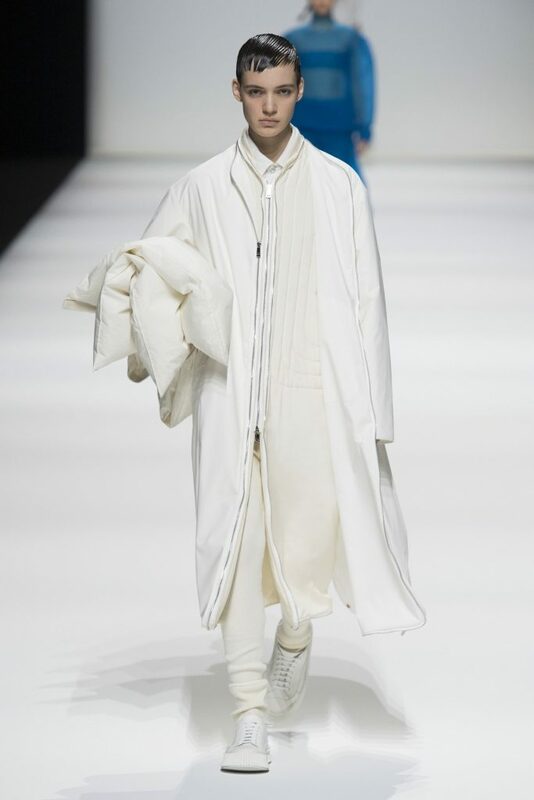 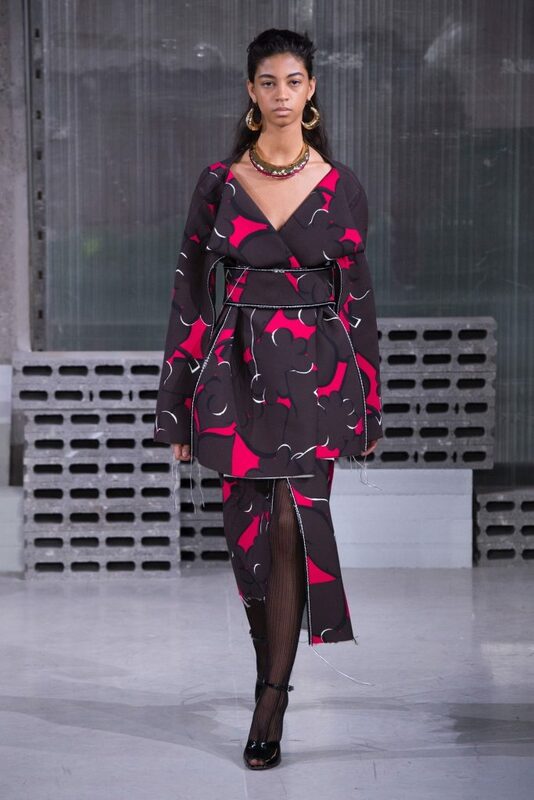 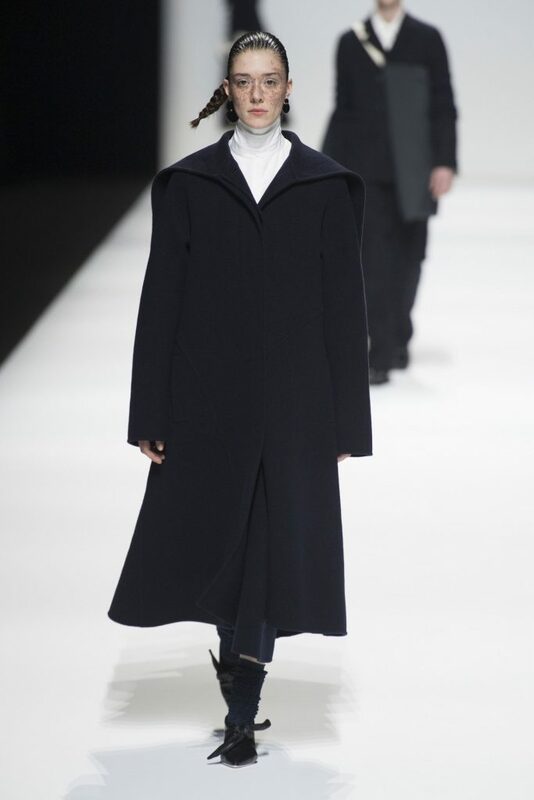 The models wore duvet blankets wrapped around their shoulders, thick, ribbed knits, neatly tailored coats, asymmetrical ponchos and dresses in beautifully draped silhouettes. 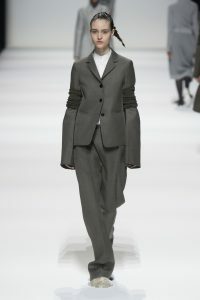 It was an optimistic and comforting take on the fashion future that awaits. 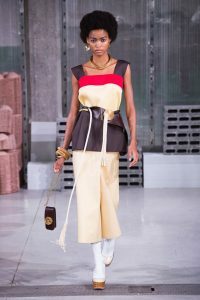 In the fall of 2008, Jourdan Dunn was the first black model to walk Milan’s runway since Naomi Campbell in 1997. 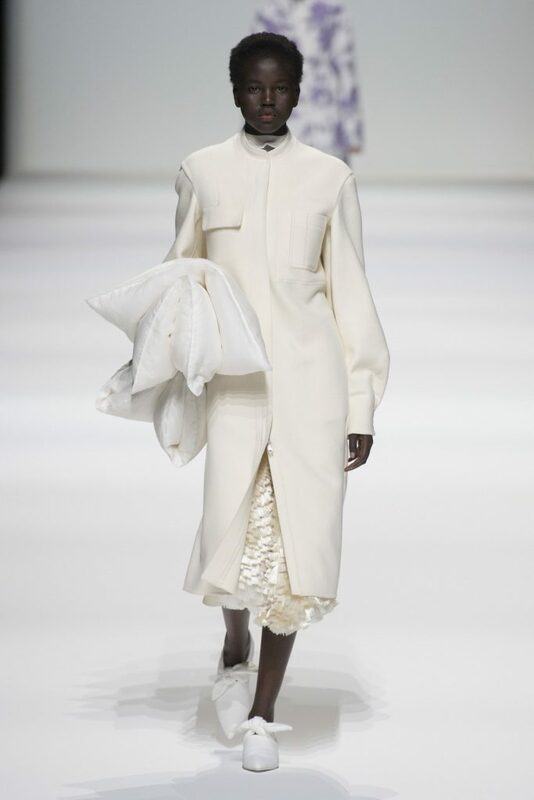 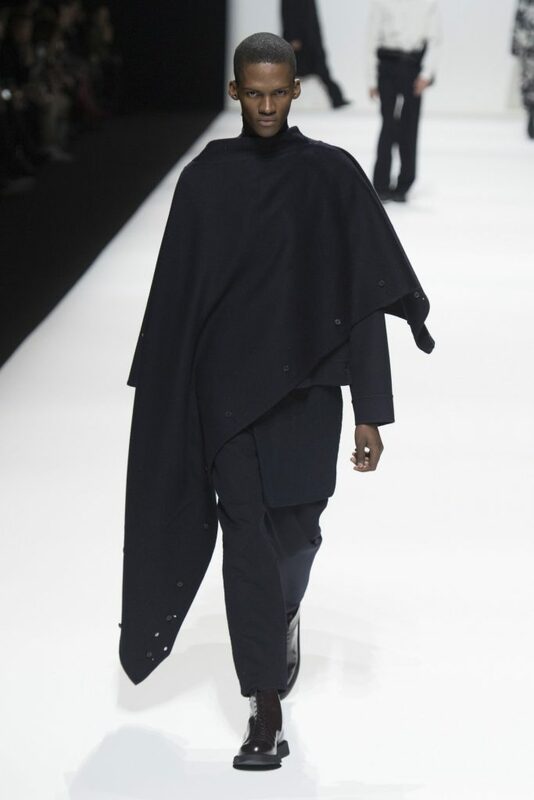 This year, Sudanese model Anok Yai was the first black woman to open the show since Campbell. 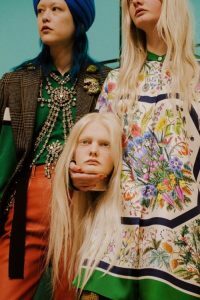 Perhaps now we can finally state that a diverse cast of models isn’t just a current trend – it’s the new standard. 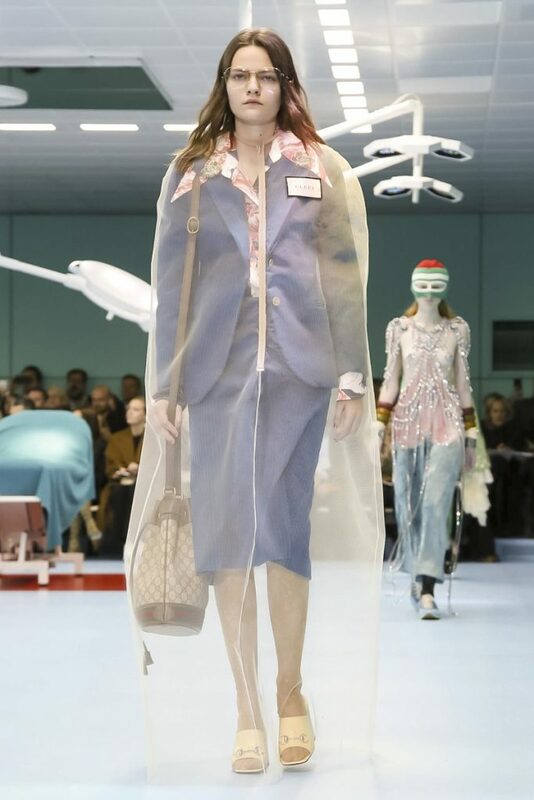 Layered tweeds, construction worker vests, bags carried in twos, shoes in drawstring leg-coverings, and ID cards pinned to the chest. 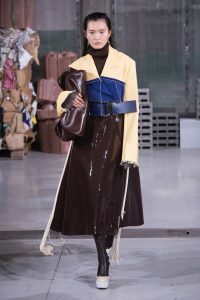 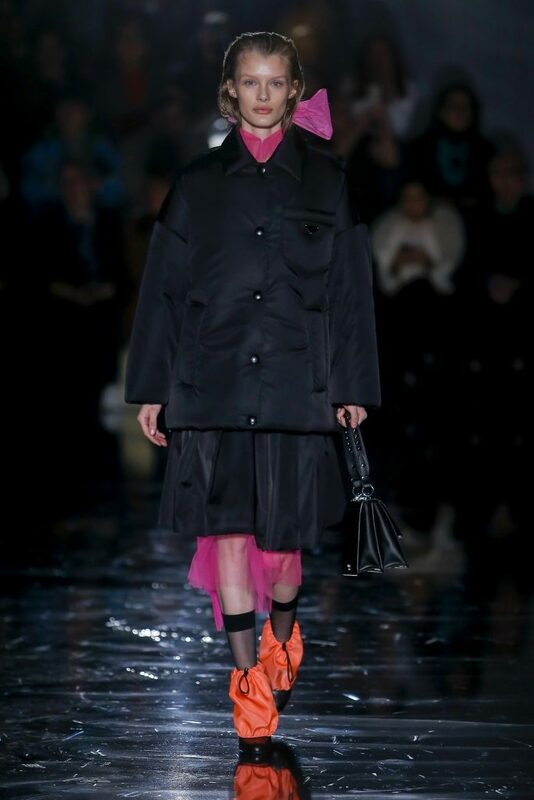 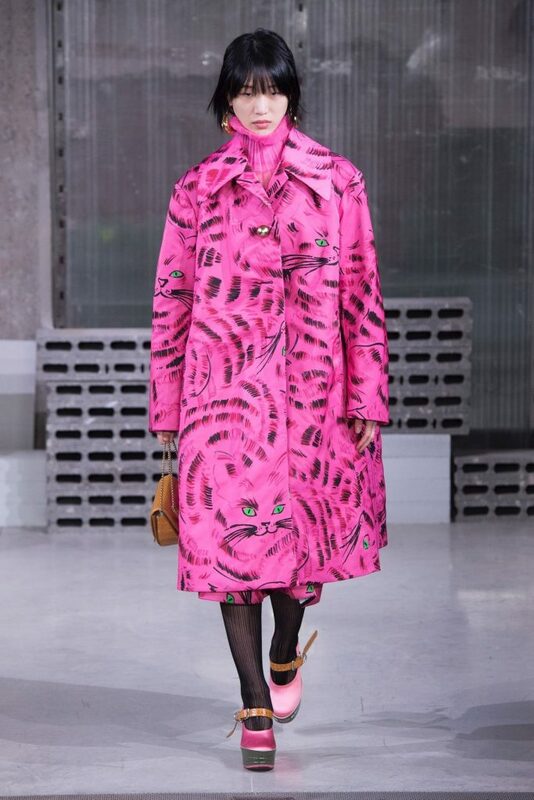 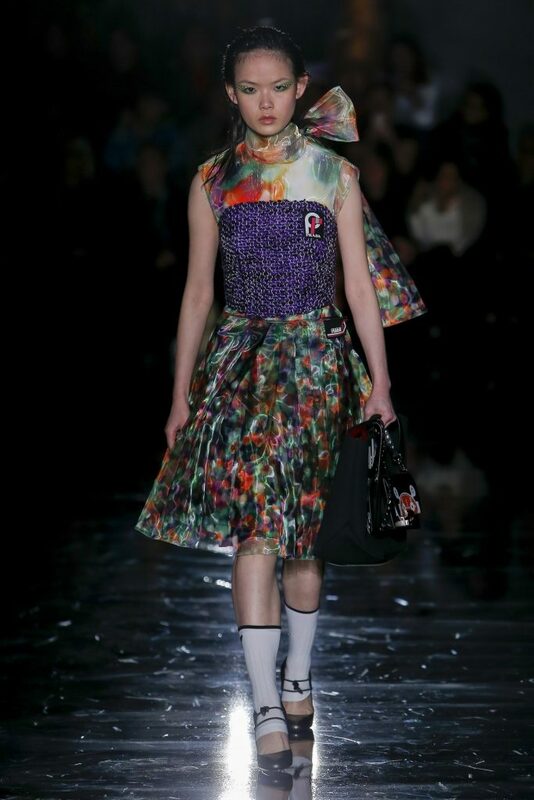 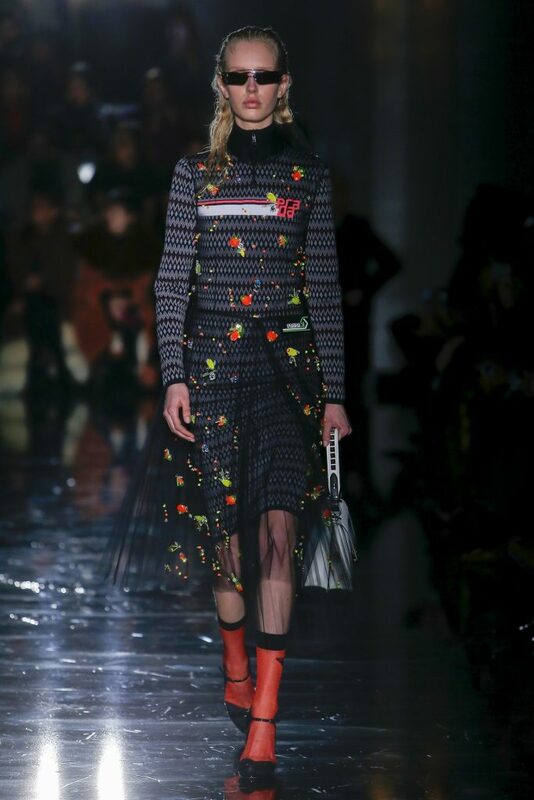 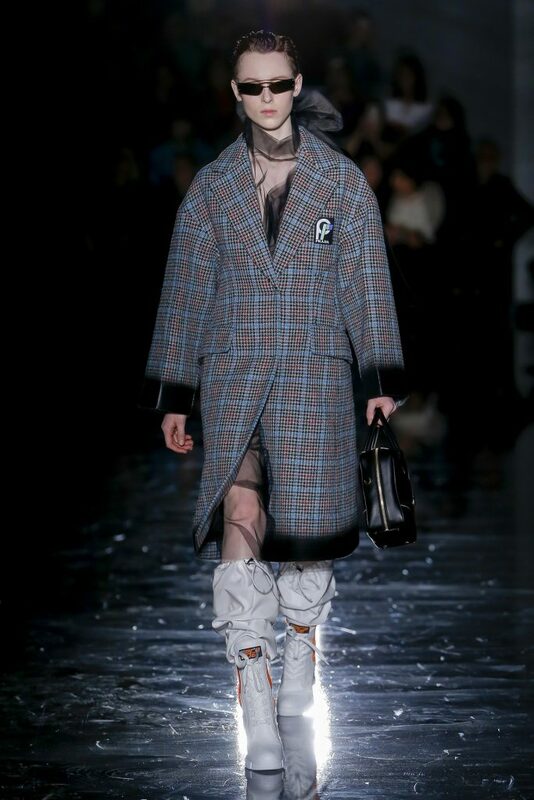 Miuccia Prada’s fall ’18 collection is an ode to female freedom, protection and strength.